I recovered doing the Lightning Process. 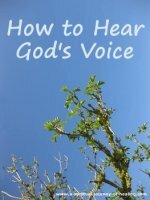 Scriptures On Healing were a huge part of my recovery from bedbound to walking. EFT tapping technique works as a physical and emotional treatment for any illness. It is an alternative treatment for ME /CFS and a healing practice that you can make part of your life. You can tap on anything. NLP techniques free us up to learn new ways of moving forwards. Qigong healed a long running knee pain and the Qigong DVD helped me find the discipline to rest. What do the terms CFS and ME mean? The journey work is outlined in the book The Journey, by Brandon Bays. I carried out the Journey whilst living with chronic illness and disability. As a result of the journey work a spasm in my right eye stopped. This made a huge difference to my ability to focus and the extent of the head pain and irritability. The Journey work is excellent for allowing us to feel our feelings, instead of running away from them. The process allows us to first feel the feeling and then pass through it instead of getting lost in it. To buy the book of The Journey work from Amazon USA or Amazon UK, please click on the appropriate book cover above. There is a physical Journey process and an emotional Journey process, but often physical improvement can follow on from the emotional process too. Often, when life is hard, it helps to take advice from someone who has been through physical and emotional difficulties, so we can feel confident that they are qualified to help us. 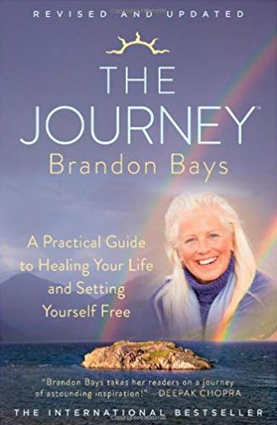 The author of the Journey work, Brandon Bays, has definitely been challenged to continue to love herself and others through a whole variety of life traumas. These include healing from cancer so advanced that she looked pregnant with the tumour. For me, the Journey process did not prove to be a treatment for CFS as a whole, but by helping with the symptom of vision problems, it made a huge difference to my quality of life. I recommend the book highly. 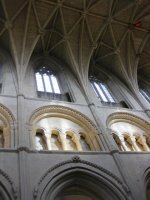 After I was back to walking, I also attended a Journey weekend to experience the journey work with others. Again, I recommend it highly. Books have been an important source of information for me on alternative self help treatments for cfs. Mind you, at the time, I did not have the access to the internet that we have today! Acupuncture helped me with knee pain and back pain, but did not help me personally with recovery from Chronic Fatigue Syndrome (CFS). It may well help you. Acupressure is a version that you can use on yourself or ask a friend to use on you. 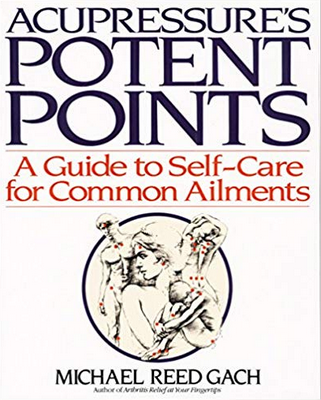 There is a great book which gives the points for many different conditions. Those points for Fatigue and Immune System boosting are probably the most relevant as treatments for CFS. I also found many others to be helpful. For example, the vision points and the stomach points. Acupressure can help alleviate symptoms and give a sense that you are doing something to help yourself; something which – in my experience – is very valuable in giving you a greater sense of control. There is an image on the right of this CFS article containing the links to buy Acupressure, How to cure common ailments the natural way in the UK and in the USA. I supplemented with magnesium over all the years I was ill. It was one of the few treatments for CFS that definitely helped. It reduced muscle pain. Magnesium injections did help, although not dramatically. Early on in the illness, following blood tests and professional advice, I had started taking Vitamin B and magnesium supplements. They had a dramatic effect on reducing the symptom of depression. 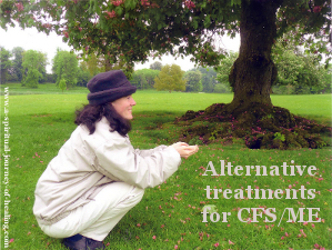 I have tried many other alternative treatments for CFS over the years. I am not listing them here as they did not lead to my recovery. Please know that different treatments for CFS work for different people. I continue to try alternative treatments. A while back I tried Proto-col Green Magic. I stopped after a while in favour of other natural healing supplements. But it is well worth trying what is often called 'a green drink' if you haven't yet done so. Green drinks are often recommended for improved energy and I know people for whom this one has made a big difference. To see reviews or buy from the UK - Proto-Col Green Magic (2 Months Supply). To buy from the USA click on the Amazon icon above. My level of health and the lack of physical support made it difficult for me to access alternative treatments for CFS other than those I could learn from books. All my resources were going on survival and I had little left over. Typically a healing crisis can take place with an alternative treatment where symptoms get worse before they get better. If I did manage to access an alternative treatment for ME /CFS, the need to push through symptoms to survive meant I did not have the chance for the rest that would allow the healing crisis to take place pageand the symptoms to do their work to restore my body to greater health. I found this so hard at the time. But of course if I had had a chance to rest and/or access alternative ways to treat ME /Chronic Fatigue Syndrome, I may have recovered through natural means and my own determination. I would not then have found the power of forgiveness and known the joy of sinking into the reality of God from whom health and healing is our natural entitlement. This is your chance to comment on this page, or to share your own experiences of treatments for CFS/ME you have tried or would like to try. Thank you for sharing your thoughts and wisdom. TIP: Since most people scan Web pages, include your best thoughts in your first paragraph. These will show up on the main page.